On every cruise, you will hear the Captain get on the ship’s PA system and bark out instructions to the crew. I’d like to share with you what the heck is going on. 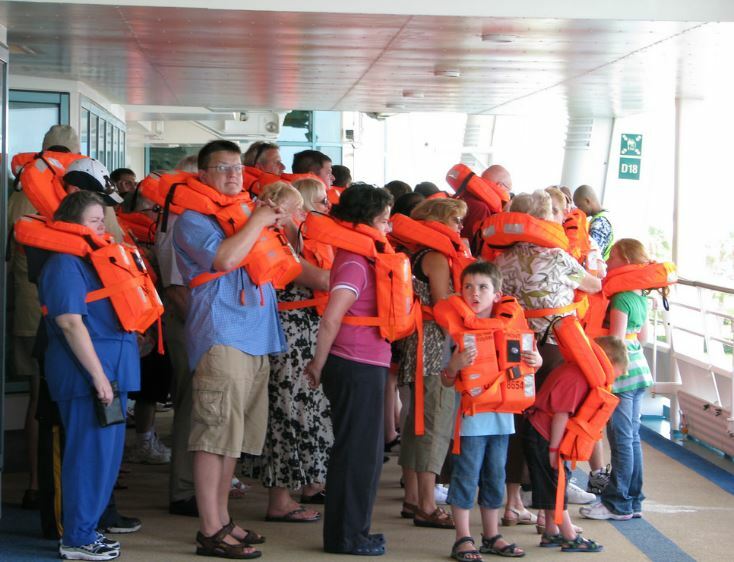 All passengers MUST attend the lifeboat drill. Roll will be called and if you do not yell “HERE,” you will be marked as absent. Then you have to take a special session just for laggards. During the drill the Captain will say: “This is a test. This is a test: BRAVO BRAVO deck 7, store room…or such….BRAVO BRAVO.” What’s up? This is all part of the lifeboat drill. They might even do it mid-cruise. It is for the emergency response team to go to the named place and practice their action. BRAVO means fire. A big deal on a ship at sea. Another one you hope you don’t hear for real is: ALPHA. This is for a medical emergency. On a 3,000++ passenger ship, people will have medical issues. Sometimes a person dies. Yikes! OSCAR is the signal for “man overboard” If YOU see this…yell “man overboard,” three times and get someone to dial the emergency phone – often x3333. If no one is around, YOU run to a phone. It’s better for you to stay to note the position, but at 20 knots, the ship will move away rapidly so it’s got to stop ASAP. Continue to point to the spot. ECHO is the word for collision imminent. Hang on!! To keep abreast of the cruise industry, tune back in on Mondays for these blogs. Subscribe and drop us a line – we want you to get free trips by lecturing. We’ll cut to the chase and teach you how to get gigs.